Harvard's Special Collections Library Marks its 75th Anniversary with the Question: "Who Cares?" Cambridge, MA (July 2017) - Houghton Library, Harvard College’s primary rare books and manuscripts library, recently announced the capstone event of its 75th anniversary year, a symposium that asks bluntly, “Houghton Library: Who Cares?” The event, scheduled for this October 5th-6th, will examine the library’s legacy, mission, and path forward through the lens of that central question and provocation. Fourteen speakers and panelists who connect to Houghton’s collections in a range of ways - as creators and collectors, readers and interpreters, colleagues in cultural heritage from around the world - will join the audience to grapple with questions around care and concern for the collections, as well as the scholarship, art, and inquiry that come out of engagement with libraries like Houghton. Organizers of the event hope to face boldly questions and concerns, cultivating an informed optimism about the future of special collections and archives that is tempered with an understanding of the problems they face in our current cultural climate. “Anniversaries tend toward the celebratory and self-congratulatory; our organizing committee hoped instead to use this opportunity to self-challenge and really do the work of building a case for care with this dynamic group of speakers and thinkers,” says Emilie Hardman, Houghton’s Research, Instruction, and Digital Initiatives Librarian, chair of the organizing committee. Each day of the symposium will feature a keynote lecture, the first delivered by Jamaica Kincaid, the world-renowned novelist and essayist. Kincaid will be followed by Johanna Drucker, internationally known for her work in the history of graphic design, typography, experimental poetry, fine art, and digital humanities. Symposium attendees will also hear opening remarks from Henry Louis “Skip” Gates, Director of the Hutchins Center for African and African American Research at Harvard University, and Drew Gilpin Faust, president of Harvard. 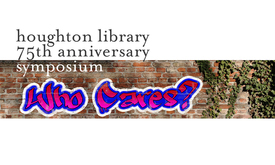 For a full schedule, presenter profiles, registration for the waitlist, and other information, please visit: houghton75symposium.org. Houghton Library is the principal repository for Harvard University's collections of rare books, manuscripts, and archives. The library’s holdings of primary source material are managed by an expert staff and shared with scholars and the public in the reading room, and through exhibitions, lectures, seminars, publications and courses. Houghton Library is located in Harvard Yard, Harvard University, Cambridge, MA 02138, USA. It is open Monday, Friday and Saturday 9am-5pm, and Tuesday through Thursday 9am-7pm. Houghton Library is closed on Sundays. Exhibitions are free and open to the public.